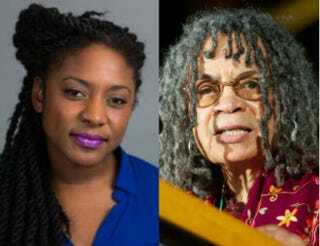 Two powerful black women, representing two generations of social activism, delivered dynamic speeches on racial justice, human rights and black radicalism Wednesday evening at Tufts University in Medford, Mass. Sonia Sanchez, the legendary Black Arts Movement poet and activist, reminded the more than 100 audience members—most of them young—that the Black Lives Matter movement is part of a long continuum of struggle that can be traced back to the period of antebellum slavery. She helped ground the event by historically contextualizing the black freedom struggle from the 1960s to the present. Alicia Garza, co-founder of Black Lives Matter and director of special projects for the National Domestic Workers Alliance, delivered an equally poignant speech that acknowledged the roots of her feminist and anti-racist activism through reflections on anti-black police violence. “This moment is about more than black men,” Garza explained, citing a list of transgender women who have been killed across the country and reading a roll call of black women who have been murdered by police. Garza characterized herself as a child of America’s neoliberal age, a stark period of racial, economic and political retrenchment and backlash. She described the war on drugs as a “war on black people” that successfully transformed black neighborhoods and communities into domestic combat zones. Over the past two years, Black Lives Matter has become a definitive term for racial, economic and gender justice that has galvanized protests, even making it to the front cover of the latest issue of Time magazine. It’s more than a catch phrase. “Black Lives Matter is the principle that we organize by,” Garza said. The movement and its name embody the political audacity to expect respect and protection for black citizens. In their speeches, Sanchez and Garcia pointed to the black freedom struggle as the linchpin of a wider human rights movement. Together, their talks formed a panoramic, intergenerational dialogue that placed the lives of black women at the center of this political narrative rather than at the margins. Garza also focused on the ways in which new technology has affected racial-justice activism in the 21st century. The Black Lives Matter movement has been accompanied by a #BlackLivesMatter social media hashtag, which started as a battle cry for black people after the Trayvon Martin killing. She said that she tried to imagine what the world would look like if black people were actually valued by American politics, society and institutions. Both acknowledged their intergenerational influences. Likewise, Sanchez said that the greatest wisdom she’s learned as a teacher has come from listening to her students. Garza shared that her efforts to “reshape democracy in our own image” have been inspired by Sanchez’s art and activism. That has been perhaps the most striking aspect of the Black Lives Matter movement: the dialogue between younger activists and veterans of the civil rights and black power eras. Young people should know their history but not be burdened by it. They deserve the chance to make mistakes and innovate new forms of activism that join a larger body of struggle shaped by predecessors like Sanchez. Although these forerunners have earned wisdom and experience and much knowledge to share, they also need to resist lecturing the young instead of engaging in mutually respectful dialogue. Black women’s lives, Sanchez and Garza remind us, not only matter but also continue to shape black political activism in the sweet spot where the past and present converge to create a transformative and potentially revolutionary future.